The “American Dream” was never “let’s get as rich as possible regardless of how many people we hurt or oppress in the process.” The American Dream has always been that anyone could have an equal shot at prosperity, and if they’re willing to contribute, they will be rewarded with a decent life; a roof over their head, food to eat, security for their family, and quality time to spend outside of work doing what they’d like to do. That’s the “American Dream.” And that dream is being sold down the road by greedy people. For decades now, congress has been writing and repealing laws with a primary goal of enriching their donors, not helping us. This isn’t my opinion. This has been proven. Back in 2014, Princeton University’s Professors Martin Gilens and Benjamin I. Page published a study entitled “Testing Theories of American Politics: Elites, Interest Groups, and Average Citizens.” The two professors studied and reviewed answers to 1,779 survey questions regarding public policy between 1981 and 2002, then broke the responses down by income level and determined how often certain income levels and special-interest groups got what they wanted from our elected government. As you can see, no matter the percentage of regular people, like us, who support a policy in government, the likelihood of adopting that policy never increases. But what happens when more of the "economic elite" or special-interest groups want the policy (like the NRA, or many others on the "left")? Done deal. "Taken care of, Mr. Shareholder. Whatever you want. We. Are. Here. For. You. Mr. Shareholder, Sir!" Congress hasn't been working for us - the people of this country - for at least 35 years now. That is why the middle class is dying off. It's not immigrants. It's not welfare (at least not for the poor; "Yes, sir, Mr. Banker, sir! We know you've had some 'bad luck' lately, Mr. Banker, sir! Here's some money. Don't worry. We took it from the poor and middle class. It's not costing you a dime, Mr. Banker, sir!"). It's corruption. It's the oligarchy. Between 1981 and 2002, proposed policy changes with low (20%) support among the very wealthy was adopted only 18% of the time. If the policy change had high (80%) support, it was adopted 45% of the time. But here’s the kicker: When a majority of the people (us) disagreed with the economic elites and/or special-interest groups, the people generally lost. On top of that, even if the elites didn’t get their way, the people usually didn’t either, even when a fairly large majority of the people supported a particular policy change. In other words, this isn’t a representative democracy anymore. It’s an oligarchy, which is defined as: A form of government in which all power is vested in a few persons or in a dominant class or clique; government by the few. As I said, that study spanned 1981-2002. Do you think it’s gotten better or worse in the last 15 years? I’d bet everything I have – which, admittedly, isn’t that much – that it’s gotten much worse. After all, we didn’t get the disastrous “Citizens United v. Federal Election Commission” ruling until 2010. That ruling essentially declared corporations to have the same constitutional rights as people, which is asinine at face value since we can’t put corporations in prison, and they can live forever, among other things. This decision led to truly unlimited corporate political donations through Super PACs (Political Action Committees), with the caveat being that the PACs cannot communicate or coordinate with the campaigns or candidates they’re supporting in any way. Problem is, that part of the ruling is almost impossible to enforce. In the Podesta Wikileaks that came out in 2016, the emails revealed a multitude of times that John Podesta or other members of the Hillary Clinton presidential campaign illegally coordinated and communicated with PACs supporting her candidacy, and nothing was done about it. In my opinion, there’s only one “minority” who’s actually ruining our country: The oligarchy. The true fight isn’t “white people vs. people of color” or “straight vs. LGBTQ” or “immigrant vs. native” or “male vs. female” or any other of these “battles” that our corporate media tells us we’re meant to be fighting. Those fights are there to distract us. There’s only one true fight: The people vs. the oligarchy. That’s it. But in order to win that fight, we have to stop fighting amongst ourselves. Even one of the largest corporations on the planet, GE, is now on board with a more "Bernie Sanders-style" economy, because they see the writing on the wall: If 90% of the people aren't making enough money to have anything extra to spend in the market, these companies are going to run themselves right out of customers. 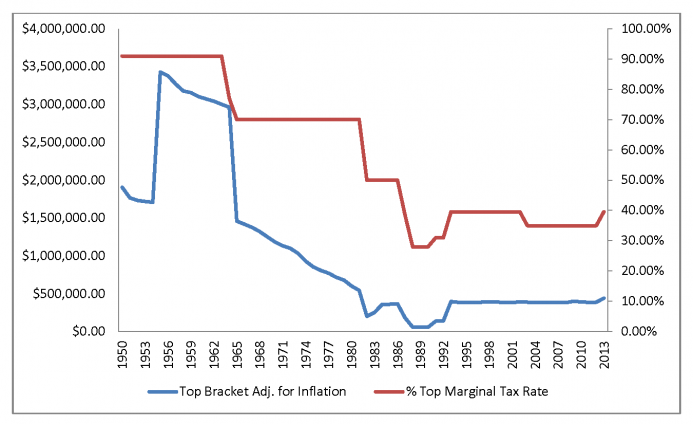 As you can see, every Top Marginal Tax Rate is at a historic low right now. Have these low taxes created jobs, as believers in "trickle down economics" (officially called "supply side economics") would have you believe? No. Because companies only - only - hire people based on need. They don't hire people because their taxes are lower. That just means they get to keep more money in profit to share with their executives and shareholders. I have a plan to address this. "The lesson here is that public goods matter. Business doesn’t operate in a laissez-faire vacuum. Policy choices have an impact, and economic value flows to communities (or countries) that invest in things such as education and training." I'm pointing this out because I think it's important that you understand this is not a "give me free stuff at the expense of the rich" policy position. This is sound economic policy for everyone. It's just not as good for the very wealthy, but we can't sit around hoping they're going to be okay with being taxed more. They won't be. 1) The current top personal-income-tax bracket in our country is 39.6% for individuals earning a taxable income (after write-offs) of $418,400, and for married couples filing jointly that number is $470,700. (During Republican president Dwight Eisenhower’s administration, the top federal income-tax bracket was set to over 90% on incomes, adjusting for inflation, of about $2 million per year.) But remember that 39.6% applies only to the money earned above that figure, and that goes for every tax bracket. For example, if we use a married couple filing jointly making $500,000, this means they would not pay 39.6% of $500,000 (which would come to $198,000) in federal income taxes. They would actually pay $143,230.80 in federal income taxes. One major problem with our current system of taxation is that the top tax bracket hasn't changed significantly in decades. And after you adjust for inflation, tax rates are lower than almost any time in the last 100 years. We need brackets set at higher income amounts, and with higher tax rates. That number is probably okay approximately where it is. What we need to do is add new brackets, such as (just for the sake of explaining the concept) 42% at $550,000, then 45% at $625,000, 48% at $690,000, and on upward until we get to something in the ballpark of 80% at $5 million per year in taxable income. Before you ask, no, I don’t expect that many people will actually pay 80% of their income in taxes. But if we pair this tax increase to a decrease in corporate taxes, under the right circumstances (for example, for corporations that hire Americans at living wages), it will cause business owners and executives to decrease their salaries (to avoid the government taking 80% of it) and leave more money in their companies, which can then be used to increase worker wages, hire more workers, and otherwise invest back into their companies through the purchase of new equipment; which also helps the equipment suppliers to do the same in their companies. It will create jobs, not hurt job growth. And, in fact, economists believe that raising the taxes on the very wealthy is a very good idea. As a caveat, I do think that an exception should be made in terms of taxes for professional athletes, actors, lottery winners, and anybody else whose opportunities at the highest income levels are likely to be short-lived. This can be done through a modified version of a windfall tax. We definitely do need to cut waste in our government, as I've covered elsewhere, along with cutting spending in general on things that don't make sense. But we also need to bring revenue up at the federal level. To do that, we have to go after those who can afford a tax hike, such as those making millions of dollars per year and up, not the middle class or poor. 2) In 1965, before Wall Street completely took over the country, the CEO-to-worker compensation ratio was 20:1. That meant that for every dollar a company’s typical worker made, the CEO made $20. Not coincidentally, the top tax bracket at that time was 70% on incomes over $200,000 (married, filing jointly), which is about $1.5 million in today’s money. As of 2014, for every dollar a company’s typical worker made, the CEO made $303. Today’s ratio is 303:1! Even worse, among the companies on the S&P 500 in 2016, that ratio was 347-to-1! That means the CEOs in those companies are making almost as much money in a single day as their typical worker earns in an entire year! It’s obscene, and I believe this to be a moral and ethical issue as much as it is a fiscal issue. One way to address this is to tie corporate tax rates to this very ratio. The more disparate the ratio, the higher the company’s tax rate should be. And compensation through issuing stocks should be included in this ratio for reasons to be made clear in the next point. 3) We need to tax capital gains fairly. Capital Gains are defined as income from the sale of a capital asset, such as a house, or stocks and bonds. Current law taxes “short-term” (defined as any assets held for just one year or less) capital gains at the normal income-tax rate according to the person’s tax bracket. But “long-term” (assets held longer than one year) capital gains are taxed at a much lower rate. In 2016, before he was fired (which happened in March of 2017), Ford Motor Company CEO Mark Fields was paid a salary of “only” $1,787,500, and he also got a bonus of $2,736,000. That means he paid normal federal income taxes (as described in number 1 above) on about $4.5 million in income. The thing is, he also got $14,298,356 in stock as compensation. All he has to do is hold on to that stock for 1 year and he could cash it all in while paying only 20% of it in income taxes. (We pay 25%, individually filing, on incomes above only $37,950. He’ll pay only 20% on $14.3 million!) For that matter, when he was fired, Fields was given a “golden parachute” comprised of a $1.6 million cash bonus and about $55 million in Ford stock, which means he’ll only pay about 20% of that in income taxes if he sells all of it after only a year. There's a reason we, in the middle class, are feeling squeezed. It's because we are being squeezed. When GDP goes up, it should benefit all of us, but it doesn't. It only benefits the wealthy. This is an example of how the system is set up to favor the very wealthy while the rest of us pay more than we can afford. I believe we need to change the definitions of “long-term” and “short-term” capital gains in terms of stocks, changing the length of time for “long-term” capital gains to 10 years. And after 10 years, I believe the dollar amount of stocks that are sold should be taxed at half of the person’s top income-tax bracket; so, under the system I proposed above, if someone sold $500,000 in stocks, they’d pay 19.8% in taxes (less than the 20% they’d pay today), but if they sold $700,000 in stocks, they’d pay 24%. I also think we should protect homeowners from this higher tax burden by creating a new type of income separate from “capital gains” for the sale of a person’s primary residence. Homes shouldn’t be treated the same as stocks. If you live in a house, and maintain the house, when you sell it, you should be able to keep as much of the increase in value as possible. There's a myth that's been going around for a long time about the taxes being so high in the US that they're prohibitive to business. It's not true, no matter who says it, or how often. Think about how low we are on this list, then think about the fact that we spend more than nearly this entire list combined on our military, which we use in large part to protect these same countries. Currently, Social Security is paid for by taxing everybody on their incomes of up to $126,000 per year. That means if you make $1 million in taxable income, you only pay Social Security taxes on the first 1/8th of your total income. This is another example of how the wealthy have used our representatives to manipulate tax codes for their benefit, because if you make less than $126,000, you pay Social Security taxes on every single dollar you make. We need to eliminate that ceiling so that everybody pays Social Security taxes on the entirety of their taxable income. If we did that, Social Security would not be in danger of insolvency. Our seniors and our needy people need to be prioritized over the oligarchy and the billionaire class. 5) The current tax code calls for a 10% federal income tax on individuals making up to $9,325 per year (or $18,650 for married couples filing jointly). This makes no sense whatsoever. The federal poverty level for a single person is $13,860, and for a couple it’s $18,670. People in this tax bracket cannot afford to give 10% of that money to the federal government. Not only that, but they’re likely going to be on some form of welfare. It seems like we should be able to cut back on some of the welfare by not taxing them, which should save money for the system as a whole in the process. Nobody should pay income taxes if they’re living below the federal poverty level. Period. And if we made just this change, a typical middle-class couple, filing jointly, would save $1865 per year in income taxes. Our elected leaders have chosen, repeatedly over decades, to make life harder for the many in order to maintain the privilege of a few. Now is the time to turn this around.